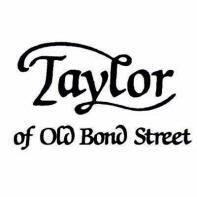 Launched late 2018 Taylor of Old Bond Street No.50 Collection Luxury Shaving Cream is presented in a screw-thread 150g tub. This shaving cream has been specially formulated without parabens making it suitable for all skin types and it creates a uniquely smooth and creamy lather whilst protecting and moisturising the skin. It is scented with top notes of bergamot, mandarin and cypress that leaves your skin feeling fresh and soft. Fragrance: A classic fragrance with top notes of bergamot, mandarin, cypress, middle notes of orange flower, lavender, oceanic and base notes of vetiver and woody amber. Size: 150g tub with screw top. For best results, use with a good quality shaving brush and a few drops of warm water, lather for around 1 minute until a rich, thick and emulsion-like lather is formed then paint onto the face. A rich lathering shaving cream scented with top notes of bergamot, mandarin and cypress that leaves your skin feeling fresh and soft. Can be applied with or without a shaving brush but for best results, apply with a shaving brush. Check out our full range of Shaving Brushes. Not the Shaving Cream for you? Browse our entire range of Shaving Creams.